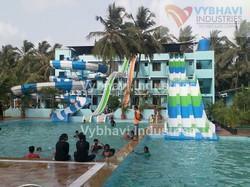 Leading Manufacturer of amusement water park slides and amusement water parks from Vasai. We have risen to prominence in the domain of manufacturing and supplying of Amusement Water Park Slides. Primarily, these spiral slides are in various diameters and are fully customizable. These tube slides are manufactured from the high-quality material and are known to give unbelievable experience to the kids. Finally, these tube slides are offered at suitable prices to our beloved clients. From the past many years, we are engaged in offering an optimum quality range of Amusement Water Parks to our clients. The offered product is manufactured by our professionals using cutting-edge technology as per set industry norms. This is stringently tested by our quality controllers before dispatching to the clients. Looking for Amusement Water Parks ?